WASHINGTON—Puzzled by the incredibly generous anonymous gift, the American populace was reportedly curious Friday after discovering a mysterious, eccentric benefactor had paid off the country’s debt in full. 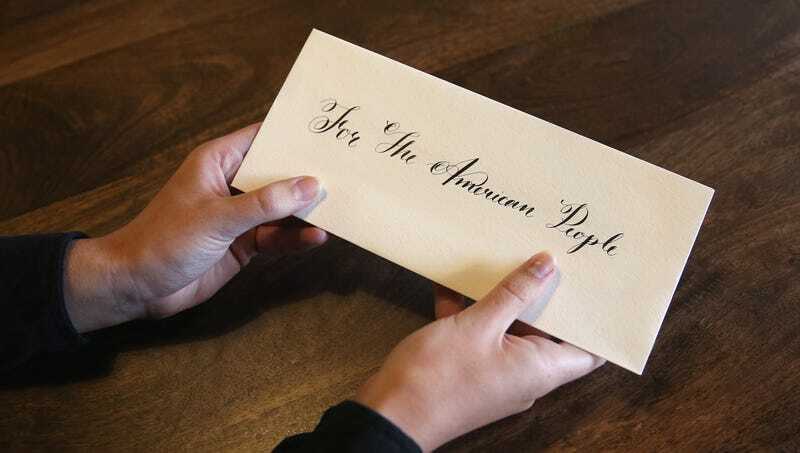 “Dearest Americans, I humbly bestow upon you an endowment most desirable, to be unburdened fully from your fiscal indebtedness,” read the enigmatic letter sealed with a wax stamp bearing an unknown crest and handwritten in a flowing, calligraphic script, which elegantly stated that the $20.4 trillion the country owed would be an issue no longer. “Long have I beheld your citizens from afar, struck by what grand feats your countrymen’s industriousness might produce if ever unbridled. So go forth now and fund your schools, social welfare programs, and infrastructure projects without fear of Chinese debt collectors knocking at your door. My manservant will deliver the funds to the Federal Reserve forthwith.” At press time, Americans had blown all the money that had been given to them on hot tubs and RVs.